Early this morning I received a shout out from my friend, Karen, wishing me a “Happy Pi Day” and that set the stage for the day. I am sure I would have remembered it sooner or later, but it was nice to get the word “pie” on my “to-do” list right away. It took a trip to the store to gather some ingredients before I could bet started… apples, mushrooms, eggs… and then the pie making began. It was far from an orderly process, but before long, I had made the pie dough made (two kinds – one “regular” and one that was gluten-free). Then it was time to cook the vegetables for the quiches – one with broccoli and mushrooms and one with asparagus. When those two pies were in the oven, I got the apple pie going. Finally, after a few hours, I had three pies sitting on my counter. Looking at those three pies on my counter made me think back to high school geometry class (it is pi day after all!) From what I recall, at the beginning of the year, my head felt like it was swimming, but my teacher, a very patient woman named Mrs. Simmons, explained it all. Before long, I was able to recite theorems, solve for x and y, and I learned that math could be fun. Unfortunately, I don’t think I ever properly thanked Mrs. Simmons for guiding me through geometry that year and it is too late to do so now. Claire Anita Simmons passed away nearly six years ago (I just looked it up). I would have so loved to gift Claire Simmons a pie with my deepest thanks for sharing her love of math through teaching. Instead, the three pies found homes with my friends. 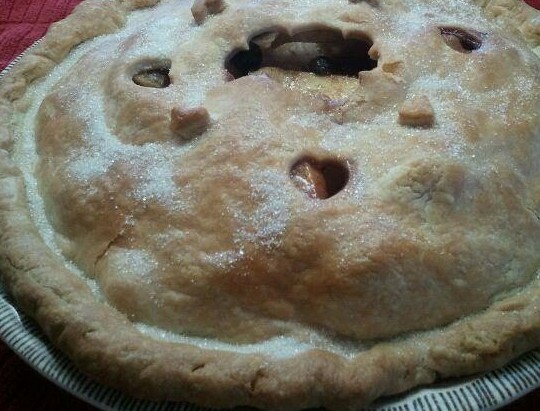 One, a teacher, was thrilled to have the Apple Pie to share with her children. The Asparagus quiche went to a friend and her husband as they face health challenges… and the Mushroom Broccoli quiche went to a friend simply because she loves my quiche. As Pi Day 2016 comes to a close, my hope is that you all had a lovely pi(e) day. And, while you still have the chance, I hope you’ll take the time to thank a teacher who made a difference in your life. Or for that matter, take a moment to thank anyone else you owe some thanks to. I promise, you’ll both feel good about it! You say it’s Pi Day? Seems like it’s always Pie Day around here! A few weeks ago, my husband Emile read an article about the Ashland Emergency Food Bank in the local paper. The focus of the article was that the food bank was going to hold an open house/pie social to launch a capital campaign to purchase the facility where they are currently housed. If they succeed in doing this, the food bank will attain a permanent home and thereby ensure its presence in our community for years to come. After he read the article, Emile turned to me and said, “Don’t you think you should help with that?” There he goes again… always thinking up good things for me to do! But his suggestion intrigued me enough to call Pam Marsh, the director of the food bank and ask her about her plan for making pies for the social. Pam’s response – “I haven’t gotten that far yet!” was something I could easily identify with. I’m not big on planning which sometimes can be problematic. However, most of the time things work out just fine. Pam and I talked a bit over the next week or so and we arranged a day to meet at the First Presbyterian Church with as many people as we could gather together to bake pies! The morning of the bake-fest I showed up early and brewed some coffee and waited hopefully. Soon Pam arrived with loads of ingredients (including a case of apples) and for a few minutes it was just me and Pam. Then, one by one, the ladies showed up. They came carrying rolling pins and aprons and were ready to work. It was absolutely wonderful! In no time at all, we assembled 24 beautiful pies. Most of the pies were apple, but there were a few berry pies in the mix as well. I’d like to offer my deepest thanks to each of those ladies for putting their caring hearts and valuable time into this event. 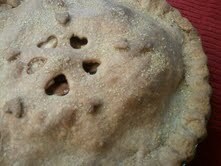 The “Pie” volunteers are (listed alphabetically): Carol Baker (perfect name for the project, no? ), Patty Chase, Barbara Hanson, Linda Lanzhammer, Barbara Marsh, Kathy Sager, and Leslie Sargent. 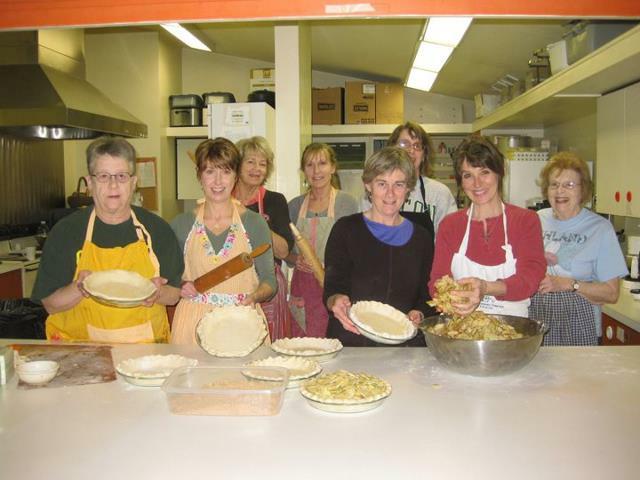 The Pie Social was held on Sunday, March 10. It was a beautiful day and many people showed up to show their support for the food bank, to visit with like-minded individuals, and (drum roll please!) to enjoy a piece of pie! It was a terrific event and I am so glad that Emile suggested that I get involved. Because of his idea I met Pam… and got to work on a fun project with a great bunch of women. Another team that I am proud to be a part of is the volunteer group that works at the Rotary Garden. This is the fourth year that the Ashland Rotary Club has been growing vegetables for the food bank. One of our Rotarians came up with the idea and from that flash of inspiration we have raised thousands of pounds of fresh produce that has benefited the needy people of Ashland. 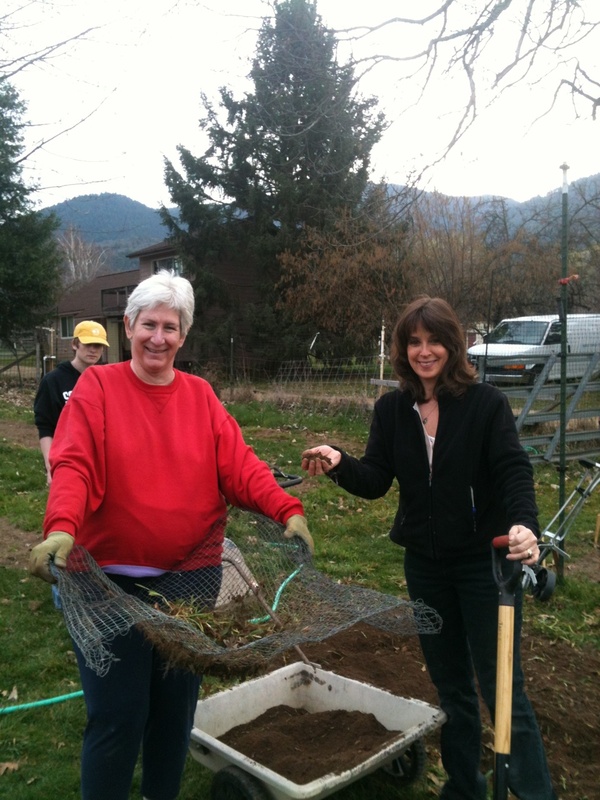 Ann Marie Hutson and I worked yesterday at the garden sifting soil. As great as that is, I have discovered a personal “perk” from volunteering my time for the garden. I’ve found that by working side by side with my fellow Rotarians we have become better acquainted, and true friendships have developed. Yesterday, on International “Pi Day”, I baked an Apple Blueberry pie for Mark Jaffe, the current coordinator of our garden project. I want to thank him for taking the helm of this very rewarding and worthwhile endeavor. As I was driving to a meeting this morning, I was reminded by a reporter on NPR that today is Pi Day… meaning that today’s date is 3/14. Now for some, that may be news. However, at least for the last 342 days, every one of them has been a “Pie” day for me. Why pies? Because they are special… sort of a relic from a bygone era. Not many of us make pies anymore and making a pie for someone seemed to say, “you are special… and I appreciate you.” It is something that I felt I needed to do… to recognize the people that have made a difference in my life… or in the lives of my friends or neighbors. To take a moment to say thank you to someone each day was my goal… and it has been such a wonderful journey. Today I chose to recognize the Ashland Police Department. When I was a kid, I lived in a “housing project” and we had two regular uniformed officers that patrolled our area. As kids we knew that if there was trouble, all we had to do was find the officer on duty and he would help us out. Since I have lived in Ashland, I have only had to call on the police one time. A young girl, high on something, came to my door one night and knocked. As luck would have it, that was the same night that my (then young) son had decided to spend the night at a friend’s house. I thought the person at the door was the parent telling me that my son wanted to come home. Instead, I opened the door to a young woman, trying to get into my house, thinking that she was home. We called the APD and an officer arrived at our home within minutes. We found the young woman in my garage, asleep on a pile of laundry on the floor. She thought she’d made it home. The officer woke her up and took her home… but before leaving asked if I wanted to press charges. “No”, I replied. But then a short time later, a woman who was the youth liaison for the police force, asked if I would allow the young woman to come to my home to apologize. When I said, “She doesn’t need to do that” the woman said, “Yes, she does” and so we arranged for a meeting. A few days later, the young woman and the liaison came to my home. The young woman said that she’d been out with friends and someone had “slipped” something into her drink. I told her, “If they let that happen, and then let you walk home alone, they are not your friends.” And then I told her that I was glad that she had come to my door because I did not harm her… and then I asked her to get some new friends. Today I want to thank the folks at the Ashland Police Department for doing what they need to do everyday to keep us safe. There are not many of us that would take their place… and I want to show my appreciation for all of their hard work in our community.